Last weekend, the boys found a bird on the ground by our back sliding glass door. We told them to “leave it alone” with the hopes it would fly away. They built a little fortress around it so it would “be safe” while it recovered, but it rapidly became clear that the bird was not going to go anywhere on it’s own. It turns out we live about five minutes away from Native Songbird Care & Conservation so I called them, and then found a box and old towel to transport the bird. Line the box/bag with something soft so the bird is insulated and does not slip around. Please note: if you are transporting a hatchling or nestling bird, please fashion a small nest using a clean soft cloth around the baby to help insulate it – they cannot regulate their body heat at this age. DO NOT off the bird any food, water or medication – the wrong food can kill a bird, fluids when administered improperly can kill a bird, the wrong medication/medical treatment can kill a bird. 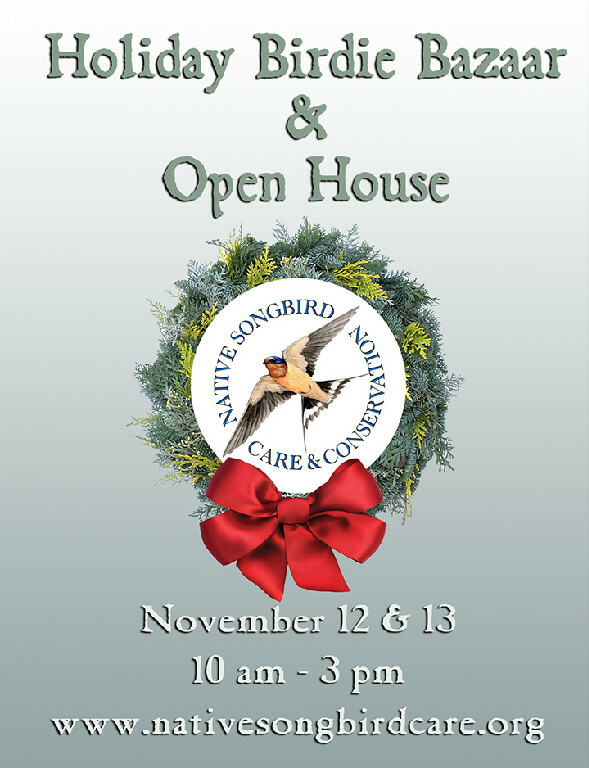 Call us ASAP at (707) 484-6502 to let us know you’re on the way with a bird. The boys went to the park, and I took the bird in to get cared for. 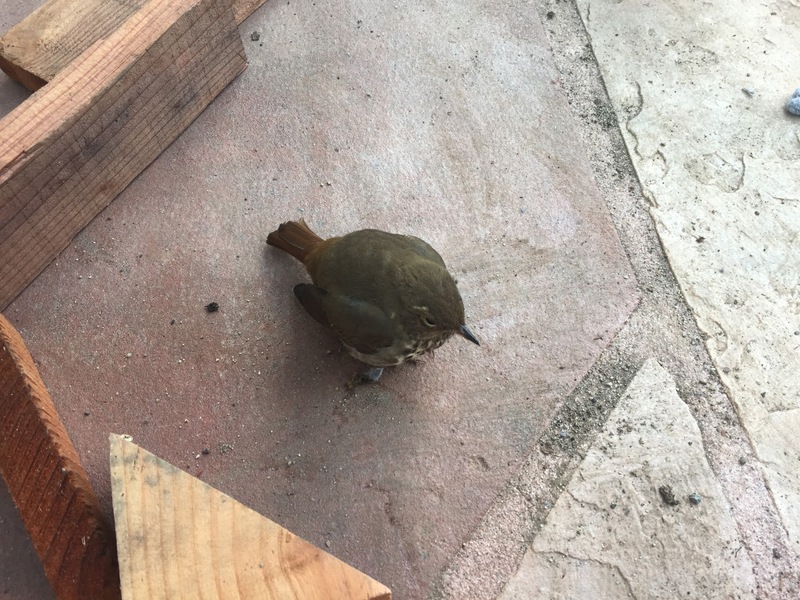 The little bird was most likely a window-hit, and clearly in need of medical attention — swelling, but nothing obviously broken — a good sign. I chatted briefly with the staff member, and left with a hand full of pamphlets and information about the center and window safety. One of the cards was for the Holiday Birdie Bazaar and Open House, and as the boys were curious about what happened to “our bird,” we decided to check it out. The volunteers were great, they answered all our questions — “our bird” was doing well and out in one of the aviaries. We got a tour of the bird hospital, and took a walk around the grounds. 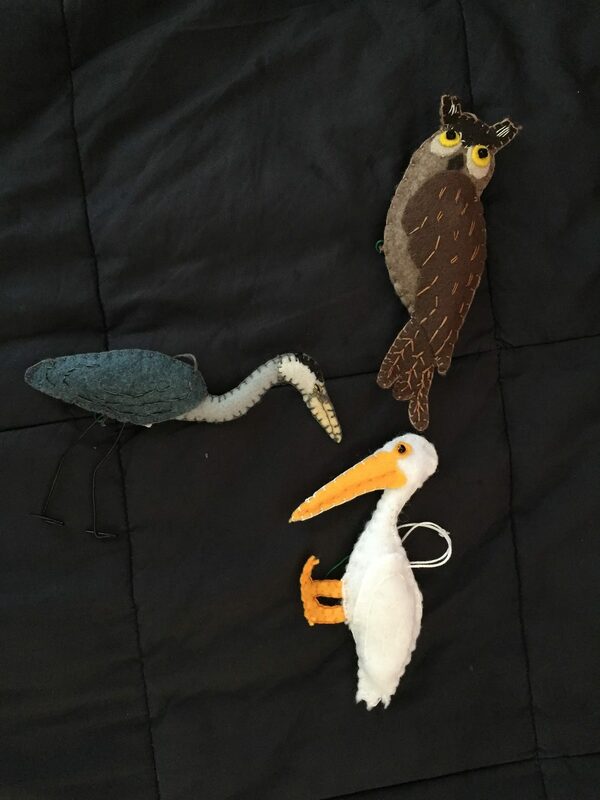 As it was a fundraising bazaar, each of the boys got to pick a handmade ornament, Oliver picked an owl, Patrick picked a pelican, and Gavin and I picked a heron. We also made an additional donation, to help offset the costs of the bird we brought in last week. This is the first bird we’ve found stunned by our windows in the eight years we’ve lived here, we are making plans to do something to make our windows more bird-safe. Hello! This is Veronica Bowers from Native Songbird Care & Conservation. Your sister shared your blog post on an fb group that we both belong. Just wanted to give you an update on the little Hermit Thrush you brought in. He made a speedy recovery and was released last Friday. Thank you for rescuing him AND thank you for attending the Bazaar! Hi Veronica, What a small world! I will tell the boys the wonderful news. Many thanks for all the work you do!